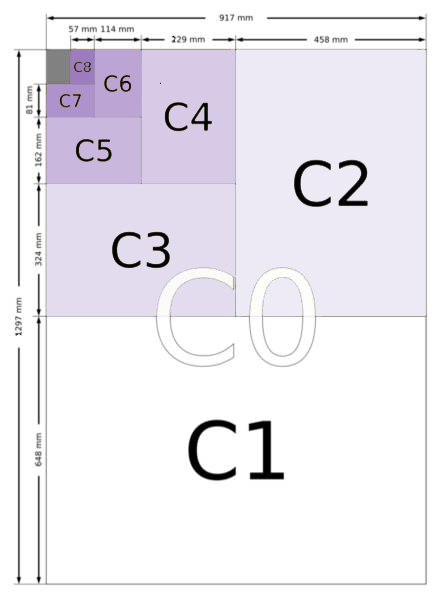 The dimensions of the A series paper sizes, as defined by ISO 216, are given in the table below in both millimeters and inches (cm measurements can be obtained by dividing mm value by 10). The A Series paper size chart to the right gives a visual explanation of how the sizes relate to each other - for example, A5 is half of A4 size paper and A2 is half of A1 size paper. The A series paper sizes are now in common use throughout the world apart from in the US, Canada and parts of Mexico. The A4 size has become the standard business letter size in English speaking countries such as Australia, New Zealand and the UK that used to use British Imperial sizes. In Europe, the A paper sizes were adopted as the formal standard in the mid 20th century and from there they spread across the globe. C Series Envelope Sizes Chart. C envelopes sizes are defined as the geometric mean of the A and B sizes with the same number i.e. C4 dimensions are the geometric mean of A4 and B4. This produces a size between the two that makes an envelope that will neatly hold the A series paper of the same size, thus a C4 envelope is perfect for an A4 sheet of paper unfolded.It should be noted that C format envelopes also have an aspect ratio of 1:root2 and because of this an A4 sheet folded parallel to its shortest sides will fit in a C5 envelope and folded twice will fit a C6 envelope. The following diagrams show C4, C5 and C6 envelopes compared to A4 paper size (the envelope being shown in brown with the paper shown as grey) as can be seen in the first diagram the C4 envelope can contain an A4 sheet, the C5 envelope can contain an A4 sheet folded in half (an A5 sheet) and the C6 envelope can contain an A4 sheet folded in half twice (an A6 sheet). This is the reason that you will sometimes see these envelope sizes being referred to as A4 envelope size, A5 envelope size and A6 envelope size. One of the most widely used business envelopes, the DL format does not fall under the C series sizes as it has a different aspect ratio. This envelope originated in Germany in the 1920's and was known as DIN Lang, but DL is now more commonly expanded to 'Dimension Lengthwise'. 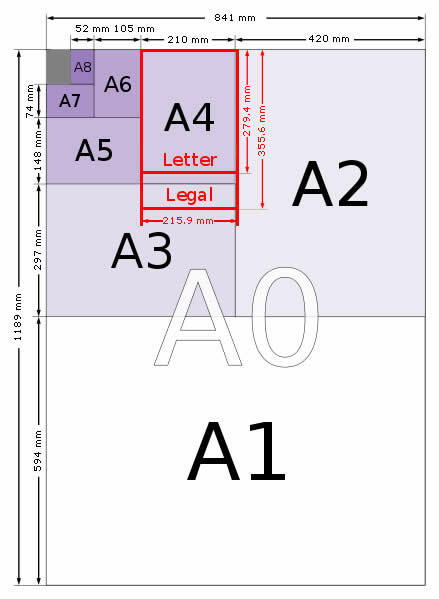 This size is defined in the ISO standards for envelope sizes, as the standard would have been remiss in omitting the most commonly used business envelope size.The dimensions of DL are 110 x 220 mm (4⅓" x 8⅔") and as such the DL envelope will hold an A4 sheet of paper folded into 3 equal sections parallel to its shortest sides. Despite complaints from manufacturers of automatic enveloping machines that it is slightly too small for reliable enveloping and the introduction of a C6/5 envelope at 114 x 229 mm, the original DL size continues to be most commonly used. The dimensions of the B series paper sizes, as defined by ISO 216, are given in the table below in both millimeters and inches (cm measurements can be obtained by dividing the mm value by 10). The B Series paper size chart to the right is a visual explanation of how the B paper sizes relate to each other. B Series Paper Sizes Chart. 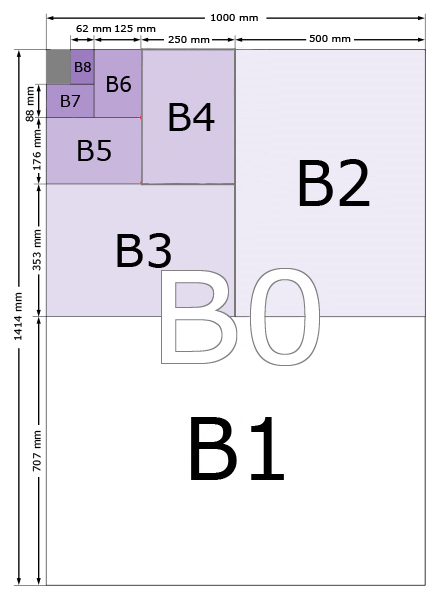 The B series paper sizes are defined in ISO 216 in the following way. Geometric Means of 2 numbers being the square root of the product of the two numbers. This system gives a useful property for enlarging and reducing documents in that the enlargement from A(n) to B(n) is the same as that from B(n) to A(n-1). As with the A series paper the standard lengths and widths are rounded to the nearest millimetre.